This case study is following researching a house history located in Shrewsbury, Missouri. You can click on the links for Part One, Part Two and Part Three. In the last post I mentioned that an auction for the farm owned by John Murdock appeared in the local newspaper in 1869. The ad indicated that 350 acres of Murdock Farm was to be auctioned off to pay debt, with the mansion (where the Murdock family resided) and some land reserved. More ads to the same effect were listed in the paper in 1870, but the St. Louis City Directory for that year still showed Murdock residing at Laclede Station. (Remember that at this time the rural properties were not given addresses per se but instead the nearest railroad station was given as the address.) In January of 1871 Murdock’s partner Charles K. Dickson died. By March Murdock had filed an application for sale of real estate owned by the firm of Murdock & Dickson. Debt of the company was estimated to be over $245,000 while the partnership itself was only valued at $25,000. On May 1st, the Murdocks executed a Deed of Trust with Isaiah Williamson for a loan of $30,000 on the Murdock Farm. The deed stated that if the Murdocks defaulted on the loan, then the property would be sold at auction. Over the next few years a trustee for the estate of Murdock & Dickson attempted to sell off the assets of the company, and Murdock sold his portion of the partnership (or what was left of it) to O.J. Lewis & Co. Murdock continued to work for Lewis until his own death in 1880. 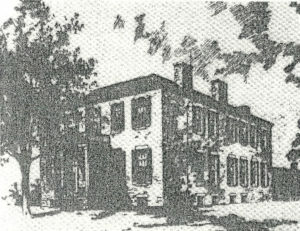 In 1878 Murdock Farm was sold on the courthouse steps to the highest bidder. Isaiah Williamson bought the property for $23,000. By the 1880 census, the Murdocks were living in the city of St. Louis. John died that year at the age of 65, leaving his 45 year old widow practically destitute with six children ranging in age from 10 to 21. Williamson held on to the property until April 2, 1888 when he sold the land to Charles Farrar. On May 22, 1889 Charles Farrar and his wife Nancy sold the property to The Shrewsbury Park Land Improvement Company, of which Farrar was President. On June 17, 1889 Shrewsbury Park First Subdivision was platted with St. Louis County, and it is within this First Subdivision that the house I am researching sits. On May 31, 1895 Farrar & Co. (owned by Charles Farrar) sold seventeen and a half fifty foot lots, including the land upon which the Murdock Mansion sat, to the Archdiocese of St. Louis for $10,000. It is within the walls of the mansion that the first masses of St. Michael the Archangel were held until a church was built and dedicated in 1897. The mansion was then used for classes and later the Notre Dame Sisters lived there. In 1920 lightning struck the mansion and destroyed it. It would be very interesting to me to understand what happened to the firm of Murdock & Dickson in the late 1860s. I have found lawsuits involving the partnership as late as 1895, long after the deaths of both Dickson and Murdock. They were running with the movers and shakers of St. Louis, and yet lost it all. They had achieved the American Dream only to have it all end in a nightmare.